The Stylish extensions for Chrome, Firefox and Opera are currently unavailable for installation on the browser add-on sites. What can you do? Here are some unofficial solutions. 1. If you have never installed Stylish and you want to install a theme. You can install a different extension with similar features, and then install the theme. 2. If you still have Stylish installed but it is disabled. Note: You may wish to review your settings related to data sharing. These are set on the "Manage All Styles" page in Stylish. It's the checkbox for "Send anonymous data to Stylish developers" — that might not be as anonymous as it sounds. 3. If you previously used Stylish and uninstalled it, and you now want to reinstall. Click 2.0.1 to download a ZIP archive of the extension. UnZip the archive to a folder, for example, you named Stylish201. Then in Chrome, open the Extensions page and enable Developer Mode. You then will see a LOAD UNPACKED link. Click that, point Chrome to your Stylish201 folder, and Chrome should load it. I don't know whether the unpacked version can access the user styles from the previously installed version. If not, I suggest removing it and using a different extension, and disabling Developer Mode. That is the subject of many other threads you can find further down the forum. You can review Mozilla's notice here: https://blocked.cdn.mozilla.net/c635229f-7aa0-44c5-914f-80c590949071.html. Stylish has had analytics and data collection implemented (namely collecting all your browser history) that didn't comply with the privacy policies of the Chrome Webstore and Mozilla's addons page, which is why Stylish has been removed and deactivated so far. Chrome is even more aggressive in the sense that even if I manually reenable the extension, I will still find it disabled when I start Chrome again. Any workaround? I don't know; I don't use Chrome very often. You might want to take the opportunity to use the feature to create a backup of your styles in case Chrome eventually removes the extension completely. I have reinstalled Stylish 2.1.1from a backup. I tested and yes it install the Stylish v. 3.1.1 (that i don't want) and not the userstyle i wanted ! Seems it's urgent to remove Stylish and use Stylus! How to install an userstyle without install their last version ? It is time to get rid of Stylish by Martin Brinkmann on July 03, 2018 - [ghacks.net]. This extension work like Stylus in other parts. 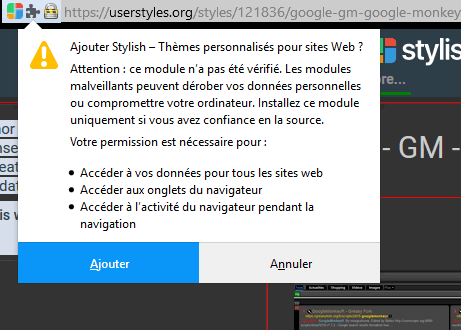 It install userstyles from this damn usertyles.org without problem . I hope OpenUserCSS became the regular reference for usertyles (but now their are not so many userstyles and some of mine can't be downloaded in it because they are too heavy)! Click to install the style. When the popup window appears, asking for authorization to install the addon, click "refuse". Then reload the style page (F5) and click again to install it. I cant install any style. Please help.. But by curiosity and easy test userstyles on other Firefox profiles using only Stylish : How to install an userstyle without install their last version ? Maybe an userscript ? Click to install the style. When the popup window appears, asking for authorization to install the addon, click "refuse". Then reload the style page (F5) and click again to install it. This works in Firefox. Maybe because you use Firefox?